If you dream of living in a home tailored to your needs, your site, your values and aesthetics, then creating it from the ground up is a wonderful adventure…one that has often been compared to giving birth! Your criteria for wanting a natural, healthy and ecological home places you in a unique position that sets you apart from the world of conventional building and has lead you to EcoNest. You are about to embark on a very significant piece of work. Although building with nature is the “path less travelled” and therefore a little more challenging, your efforts will be amply rewarded with health, comfort and beauty every day that you spend in your new home. 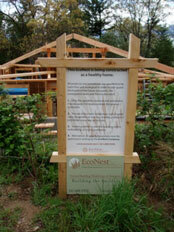 We have mentored hundreds of people through the natural homebuilding process. This is the joyful work that we do. We are here to help you too! The following are the four steps to EcoNest Ownership. Learn more about us. Read about our Design and Building Philosophy. Are our ethics in alignment with yours? Read our books. “Prescriptions for a Healthy House” will inform you in detail about the need for healthier home and about the protocols and non-toxic building materials that are applied to each nest. “Econest-sustainable sanctuaries of clay, straw and timber” goes into detail about our system and offers several case studies. This book will also help you to explain to friends, relatives, mortgage lenders and building officials about the type of home you wish to build. With 17 states and 4 provinces under our belt we can help you to answer any concerns that building officials in your jurisdiction may have. The requirements of building officials for the permitting process vary from location to location. In some areas building officials will be ready to approve your project at the outset. Others will wish to see technical information. Find out what will be required to get to “yes” with your building officials at the start of your process. Our technical page has studies, engineering and existing State Codes for straw clay construction that will help building officials who are unfamiliar with this technique. Attend an EcoNest workshop or seminar in order to prepare for the unique experience of building a natural home from scratch. 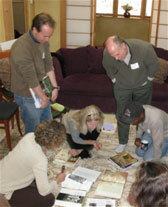 The Homing In Seminar Is an interactive and information packed day, often held inside an EcoNest home. 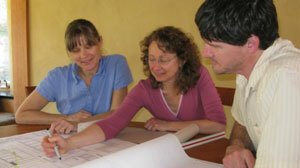 Lead by Paula Baker-Laporte FAIA the seminar will inspire you to get the most out of your design and building process. The hands on workshops are an opportunity to “interview” the natural materials that make up an EcoNest. In the course of the workshop hundreds of questions will be asked and answered. – Scott Allison Ashland, OR. A good home begins with a good design. An EcoNest begins with an exploration of your dreams, your needs, your budget and opportunities and constraints presented by your building site. Thoughtful decisions during the design process will serve you well, throughout the life of your home. We will guide you through the process and help you to get it just right. You may wish to create a custom design personalized to your exact specifications or purchase and Econest stock plan. Each set of drawings comes with a project manual that provides you, your builder and all sub-contractors with complete specifications for every phase of the construction including a resource guide explaining where to source the products you will need to ensure that your new home will be a health enhancing environment. Custom Design: With over 30 years of award winning custom home design Paula Baker-Laporte FAIA heads the EcoNest architectural team and is ready to support you in the design of your custom EcoNest at every step along the way from conception to move-in day. In looking through our portfolio you may note features or a general feel that you would like to have in your home. This information, along with other information-gathering exercises that we teach in our Homing In seminar will help get the design process rolling. Using EcoNestStock Plans: If you see a plan that suits your needs and site in our stock plan series, fantastic! You have just saved several thousand dollars in custom design fees. We can work with you on minor modifications and can also mirror these stock plans. EcoNest Affiliates: An EcoNest Affiliate is a professional builder who has taken our 16 day professional training and demonstrated proficiency in the EcoNest construction system. If there is already an Affiliate in your area then we highly recommend you contact them and interview them for the job. We are happy to work with our Affiliates to make your project an EcoNest Workshop. Builder Training: If there is not yet an Affiliate in your area, or you already have a builder in-mind, then we suggest that you select a high quality builder with a keen interest in ecology and health, who is able to take our training. They may be interested in reading more about our Affiliate Program for Professional Builders. Once they have been through our training we will offer our support throughout your project by answering their questions, helping them to source all of the healthy and ecological building materials. Potentially, we can work alongside your builder while constructing the shell during an EcoNest Workshop. Along with very detailed drawings and specifications we offer our full support to your builder who has taken our training. We will be on hand to answer any questions that come up during the process. We are also available to consult in person on projects throughout North America to home owners who wish to hire us for on-site consultations. Our architectural office offers a variety of services during the building process including assistance in making and organizing all of the materials choices from electrical fixtures to tiles to color schemes. Workshops are based around an EcoNest contracted project. What the Owner gets in return for hosting is hundreds of free “people hours” on their project and a “joyous jump-start” to the construction of their Nest. It is an opportunity for the Owner to be a catalyst in spreading knowledge about natural building , providing a valuable learning opportunity for others. As a workshop host we will help you plan for the event from the beginning and we will work closely with your local builder to make sure that the event goes smoothly and joyously. As a workshop host you will contract with our architectural branch to design and draw the project and with our building branch to construct the shell of the building. Our company guarantees that the project will be taken through to the enclosed shell, either at the end of the workshop or in the next couple of weeks following the workshop. EcoNest can either contract with you to take the structure through to completion, if you are in the vicinity of our Ashland, OR headquarters, or you can use your own local professional builder who will follow our project specification manual to finish out the building. Our Affiliate Builders are trained to host a workshop and their projects are given highest priority. We also give high priority to workshop projects where the host has already attended an EcoNest workshop prior to their own project. The EcoNest Straw-Clay Workshop or Homing In Seminar will prepare you to be a good host for the students who will participate in your home construction. Please call Robert or Paula at 541.488.9508 to discuss your project. Will you support a builder who has not taken your training? We strongly advise you to select a builder who has taken our full 16-day training prior to the construction of your house. Occasionally we are contacted by builders and design professionals who to consult on straw clay homes and we are happy to do this. However only homes designed by us and built by a builder who has taken our training are allowed to bear the name “EcoNest”. What is an EcoNest Affiliate? An EcoNest Affiliate is a professional builder who has taken our 16 day professional training and has proven their abilities in the EcoNest construction system. If you are considering building an EcoNest and there is an Affiliate in your area then we highly recommend you contact them and interview them for the job. We are happy to work with our Affiliates to make your project an EcoNest Workshop. What if there is no EcoNest Affiliate located in our area? If there is no-one trained in your area then we suggest that you select a high quality builder with a keen interest in ecology and health, who is able to take our training. They may be interested in reading more about our Affiliate Program for Professional Builders. Once they have been through our training we will offer our support throughout your project by answering their questions, helping them to source all of the healthy and ecological building materials and potentially in making the construction of your shell an EcoNest Workshop. What are the advantages of holding an EcoNest Workshop to build my shell? There are many reasons why Owners choose to hold a workshop for the building of their EcoNest shell. For some it is a way to get friends, family and their community involved in their home and educate them about ecology and health. It is a way to celebrate the construction of your new home as timber-frame, walls and roof are built in a short time-span through the magic of people working together in community. It is an opportunity to “pay-forward” the experience and insights that you gained when you attended a workshop to others who are thinking of building this way. If you are successful partner in promoting and filling your workshop than you can realize substantial savings in the cost of your shell. How can our home qualify as an EcoNest Workshop Project? You or your spouse have attended an EcoNest workshop …at a minimum the 4-day straw clay workshop and one-day Homing In seminar. You have selected an EcoNest Affiliate or an EcoNest trained builder of your choice who has, at a minimum attended our 16-day intensive training. You have either purchased a stock plan or contracted with EcoNest Architecture and have developed custom EcoNest plans and Specifications. You have a permit in place and a time-line plan to have foundations in place at least one-week before the start of the workshop. What are our responsibilities as workshop hosts? Identify housing options for workshop students. These should include camping facilities (often provided at the job site), hostel accommodations and other lodgings near by. Provide a healthy lunch, daily snacks and hydration for workshop attendees. Provide an indoor space with seating for 20 and the ability to show Powerpoint for the one-day seminar.